It is many things to many people -- it is simple, tasty, and yes, very cheap. But it is certainly not the stuff of dreams, especially the global kind. 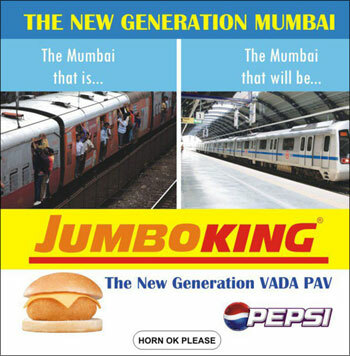 What then was Jumbo King's inspiration for weaving an entire fast food chain around this very inconspicuous product, namely, the vada pav? Simple actually. Here was a product available at almost every nook and corner of Mumbai, hugely popular and selling for as little as Rs 5. But the people selling it had absolutely no vision for putting any kind of consistency or expertise around it. In many ways, vada pav resembled the burger sold in the United States for just 15 cents before McDonald's made a grand appearance and decided to throw their might behind it. 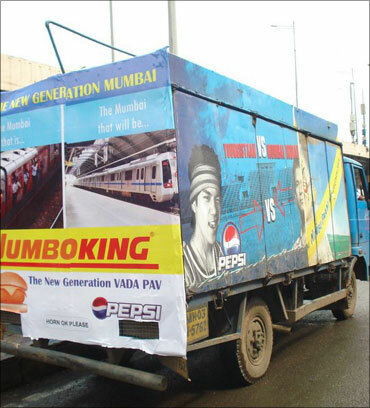 Instinctively, we sensed a huge opportunity in this product, which could be branded, had mass appeal and was already selling in the city. We knew we were taking a big risk. With Mumbai and Thane alone consuming nearly 18 to 20 lakh (1.8 to 2 million) units of vada pav a day and stiff competition, mainly from the street, why would people come to us? Only because we were selling to people a product they were already consuming every day, but with an important value add -- hygiene. 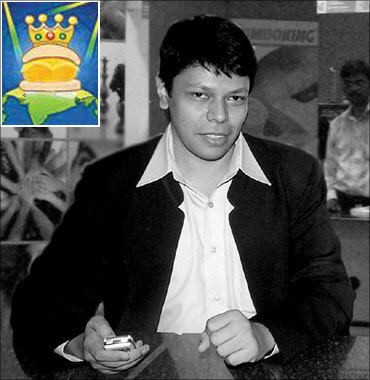 Image: Dheeraj Gupta, Head, Franchising Program, Operations and Finance, Jumbo King. Applying the 80:20 principle, we were confident at least 20 per cent people would see the logic behind opting for a hygienic vada pav and consume our product. 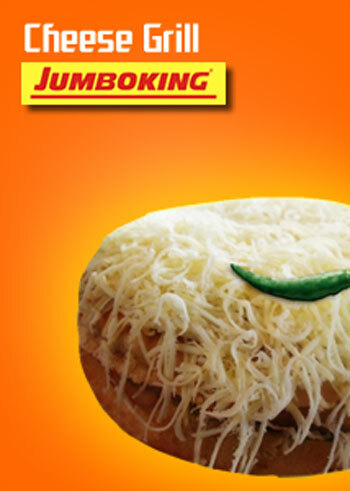 And that's how Jumbo King was born. Our first outlet came into existence on August 23, 2001. One of our first tasks was to find a bakery that would supply us breads that were exactly 3.75 inches in diameter, 1.5 inches in height and 50 grams in weight. Our pattie too was made to order: 2.75 inches in diameter, 1 inch in height and 40gms in weight. All existing bakeries were in the unorganised sector and made it amply clear that we couldn't get our kind of bread; at least not for the kind of volumes we were buying (at that point in time, we were buying only 500 breads a day). They even blamed my MBA education for what they thought was an essentially impractical view of the way business is done in the real world. It was only when I explained to them that not getting the exact size of bread would mean spoiling the taste and consistency of my product that they eventually relented. However, what happened in the process was that I had to even resort to the threat of debit in the event I got a bread that was 10 gm heavier or lighter than my requirements. This is our story then. But today, it's a completely different scenario. With 36 outlets in Mumbai and 9 in Gujarat, we are now in a position to buy as many as 35,000 breads per day, that too from two different bakeries. And because we have huge volumes and have a lot of standardisation, suppliers are finding it worth their while to put automation around manufacturing 35,000 units of exactly the same bread and the same patties. In addition to the two bakeries, we have two more vendors; one, which does the patties and the sauces, and the other, which does the dry or ambient temperature distribution, which is nothing but room temperature distribution of products such as bread, wrapping paper, etc, which don't need any temperature control. The patties on the other hand contain water, and hence, they have to be cold distributed at 5 degrees centigrade. The bread and patties are delivered on a daily basis, while other products are distributed just once a week. Fortunately, we've managed to keep the number of stock keeping units (SKUs) low so that it translates into larger volumes being distributed at fewer locations. We've now been around for over eight years and our suppliers know what to expect from us. For instance, we consume two tonne potatoes every day, so they know they can block a fixed order of 60,000 kg potatoes per month, i.e., 720,000 kg potatoes per year. For gram flour too, it's a fixed order always. More importantly, there's a reasonable amount of trust and goodwill built and suppliers know we will pay on time and consume what we've promised. Of our existing outlets, half are company-owned and the other half are franchisee-owned. We've outsourced all our manufacturing so as to avoid any conflict with our franchisees. Each store is manned by around seven people, so Jumbo King has an almost 200-strong staff. 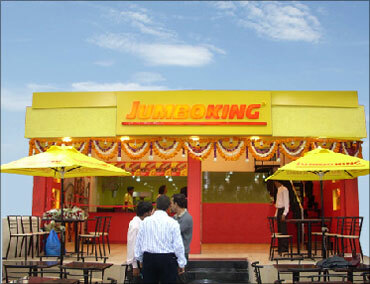 With a strong supply chain firmly in place, we are now trying to position Jumbo King as the most preferred eating option for any person who is on the go and in a hurry. It's a finger food; one that does not need a plate, a spoon or a fork to consume. Wherever people are in a hurry, they can quickly grab a Jumbo King before, say, getting into a meeting or the next lecture or the next train journey. All they need to do is visit the nearest Jumbo King outlet, buy what they want and polish it off in two minutes or simply head for the next pit stop, Jumbo King in hand. We sincerely believe it makes a lot of sense because it is priced correctly and is reasonably filling so that you don't stuff yourself too much and spoil your next meal. Maybe, people think that though we compare ourselves to McDonald's, we fall short on expectations in terms of actual execution but the truth is we are still a baby as compared to McDonald's. Possibly, the only advantage we have over them is that today, we can use even more and better machines to streamline processes even further. 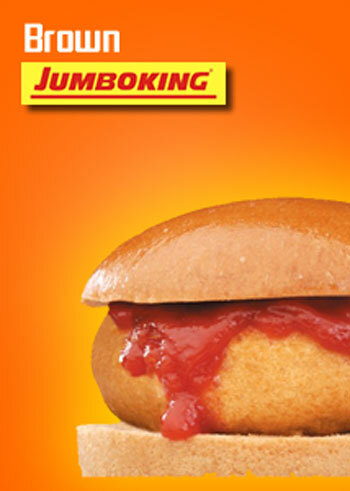 Although how we do it, how we make Jumbo King world-class, is entirely up to us. . . The author is Head, Franchising Program, Operations and Finance, Jumbo King.